Help us Purchase the world's largest solar oven!!! 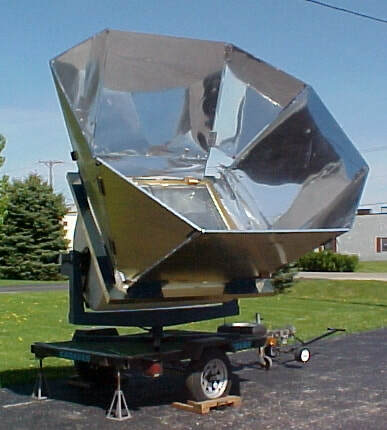 The Villager Sun Oven is the only commercially manufactured solar oven in the world! This solar oven can easily reach temperatures of around 350˚F - 400˚F with solar thermal energy alone. The giant aluminum reflectors help concentrate sunlight into the insulated fiberglass cooking chamber - when the sunlight enters the glass pane it is converted into heat. Sun Ovens International manufactures the Villager for micro-solar bakeries in other developing countries. Only ~5 Villager Sun Ovens have ever been sold in the United States! The ovens retail for $10k but I have found a used one in Colorado for $6k. I have already paid for half the oven, and I'm seeking support from my community to help me raise the second half! The Villager Sun Oven can cook 100s of loaves of bread and over a 1000 meals a day! It is equipped with a back-up propane attachment for cloudy or rainy days, and I have plans to attach a fuel-efficient rocket stove to use firewood instead. The oven will be used as part of the SolutionCraft collective and SolCraft food truck to deliver large quantities of solar cooked food to school students, community members, workshop and event participants, the homeless, and during emergency situations. Not only can it cook large quantities of food, the Villager Sun Oven can also pasteurize large quantities of drinking water and sterilize medical equipment. Do you support our vision for an ecological kitchen classroom that demonstrates a fossil-fuel free regenerative lifestyle? If so - donate today!